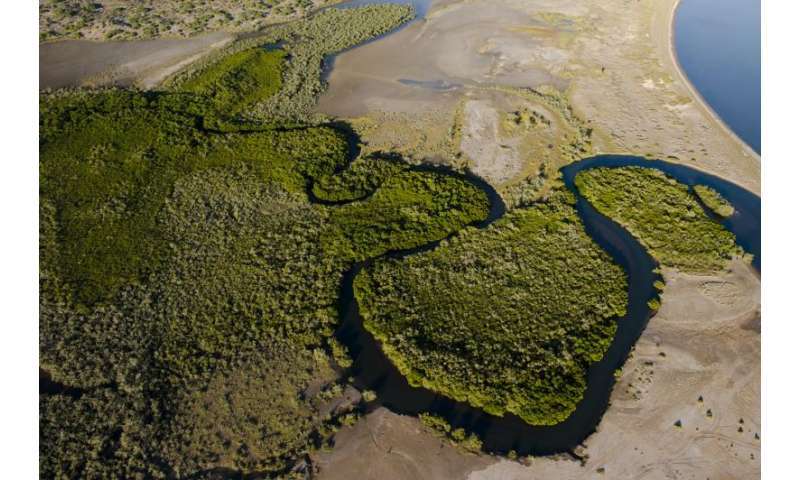 Researchers found that short, stunted mangroves living along the coastal desert of Baja California store up to five times more carbon below ground than their lush, tropical counterparts. The new study led by researchers at Scripps Institution of Oceanography at UC San Diego estimates that coastal desert mangroves, which only account for one percent of the land area, store nearly 30 percent of the region's belowground carbon. "Mangroves represent a thin layer between ocean and land, and yet we are seeing an ecosystem that is storing a lot of carbon in a very small area," said Paula Ezcurra, lead author of the study and a former researcher at Scripps. The study, published in the Proceedings of the National Academy of Sciences, was the first to estimate carbon accumulated in the mangrove's sediment peat layer, and highlights the importance of better understanding the natural history conditions where mangroves live to more accurately estimate their global carbon storage capacity. Mangroves are known to thrive in hot, salty, and muddy conditions along tropical coasts. Scripps researchers collected sediment core samples from deep below the mangled roots at two desert lagoons—Bahía Magdalena and Balandra—and two lush, tropical lagoons—Marismas Nacionales and La Encrucijada— and calculated the carbon stored at the four locations. The findings revealed a 2,000-year-old layer of non-decomposed roots, or peat, up to four meters (13 feet) under the desert mangroves. The peat acts like a sponge for stored atmospheric carbon, and provides a record of sea-level-rise history in the region. The scientists discovered that desert mangroves restricted to rocky inlets on the rugged coast of Baja California have been growing over their own root remains over thousands of years to compensate for sea-level changes, accumulating a thick layer of peat below their roots. In contrast, mangroves in flat coastal floodplains have accumulated a thinner peat layer, since they have migrated over time as sea levels has risen, and increased river sedimentation has shifted the shoreline. "The results show how these ecosystems have been adapting to climate change and sea-level rise for thousands of years," said Octavio Aburto-Oropeza, assistant professor at the Scripps Center for Marine Biodiversity and Conservation, who has been studying the ecosystem services of mangroves in Mexico, and in Baja California in particular, for more than 10 years. "Understanding the link between the natural history and carbon storage capacity of mangrove environments could give us insight into future climate change and sea-level rise." Scientists estimate that mangrove forests are decreasing by three percent per year due to increased human activities along the shoreline in Mexico, and throughout the world. Removal of mangroves result in the immediate release of thousands of years of stored carbon back into the atmosphere, and removes a natural ecosystem capable of sequestering carbon from human activity, thus causing further climate change impacts by returning a large amount of carbon into the atmosphere that has been stored underground for thousands of years. 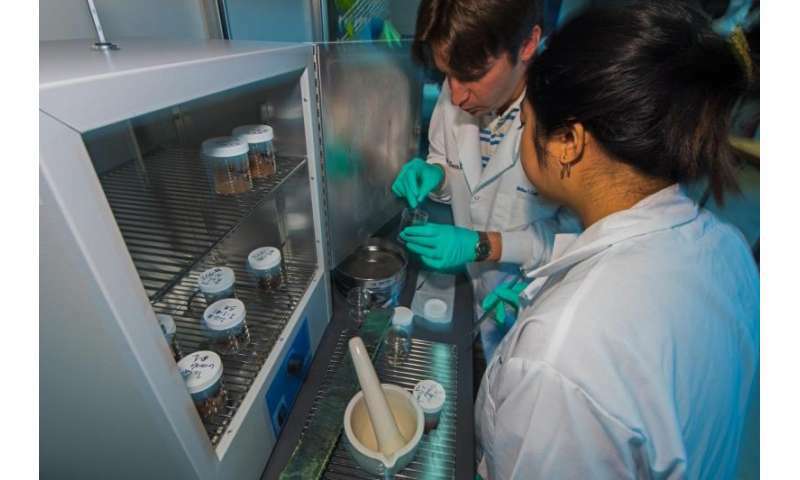 "Our study helps to further quantify the value of mangrove forest ecosystems, and highlights the importance of mangrove conservation," said Exequiel Ezcurra, an adjunct professor at Scripps and professor of botany and plant sciences at University of California, Riverside. "Hopefully it will serve to underscore the urgent need for mangrove protection and for the serious appraisal of the environmental services provided by common-access resources."